She was born Sandra Ann Goodrich in 1947. She got her break thanks to a music contest and the patronage of then popstar Adam Faith. Re-named Sandie Shaw, she hit the #1 spot in the UK charts before her 18th birthday and went on to enjoy a further seven Top 10 hits before the 60s were over. But by 1984, she was mostly forgotten. She had released a handful of singles in the 70s, but there was a gap of 14 years from 1969 – 1983 between albums. I said mostly forgotten, for the fact was a young emerging vocal talent called Steven Patrick Morrissey and his sidekick guitarist called Johnny Marr carried torches for her. At this point in time I only knew of Sandie Shaw as someone who used to get played on the radio when I was a really young kid. I assumed she was a fair age, and so was surprised to learn that she was just 37 years old when her comeback began…..
Aiming squarely for the same market that adored The Smiths, two singles, both cover versions were released in 1986, with the b-sides being straight tributes to Morrissey and then Marr. But while they were given much critical acclaim, neither single, nor a subsequent LP released in 1988, sold well. As you can see from the above cover, there was also a 12″ single released containing four songs recorded for the Janice Long show on BBC Radio 1. While I knew of the existence of this record, I never owned a copy of it. And I still don’t…..but I one day received a really nice e-mail from a reader of the old blog called Jason Ruff which talked about some great old songs from the 80s, and in which he attached some mp3 files and artwork. 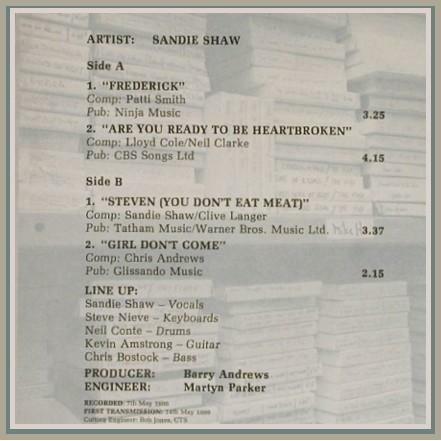 mp3 : Sandie Shaw – Are You Ready To Be Heartbroken? Note the plethora of great musicians who played on this session….